The Biggest comic event every year arrived a little bit early with Komikon having a summer installment. Just like what they promised last year, Komikon is back for a mid year fun for all comic book aficionados. May 16, 2009 I went to UP Diliman to experience once again Komikon. Once again, it is the event where I can buy interesting titles from independent to mainstream. The event is full of booths from comic book merchants to comic book organizations and artists. It is also one of those event where you can have those rare chances of meeting your favorite comic book personalities and made them sign your copy. 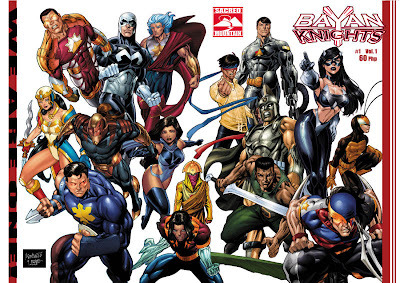 Special mention is the Bayan Knights booth where together with some artist in DeviantART shares all our original characters to create one fabulous comic book crossover. This people are so dedicated that most of them are hands on in marketing and selling. I'm very honored to be part of this group and my fearless forecast is this book will make it big when time comes and all of you should get a copy. Once again this event never fails to amuse everyone. Despite the heat and crowded venue, people from all walks of life gathers here to share our common interest: comics and collectibles. We are definitely looking forward for the second installment which will take place this last quarter of the year.